A nice addition to your Barbie collection, the new Elizabeth Taylor doll by Barbie could be yours for $150. The doll is named after Elizabeth’s White Diamond perfume and her dress is inspired after costumes she wore during her hey day. 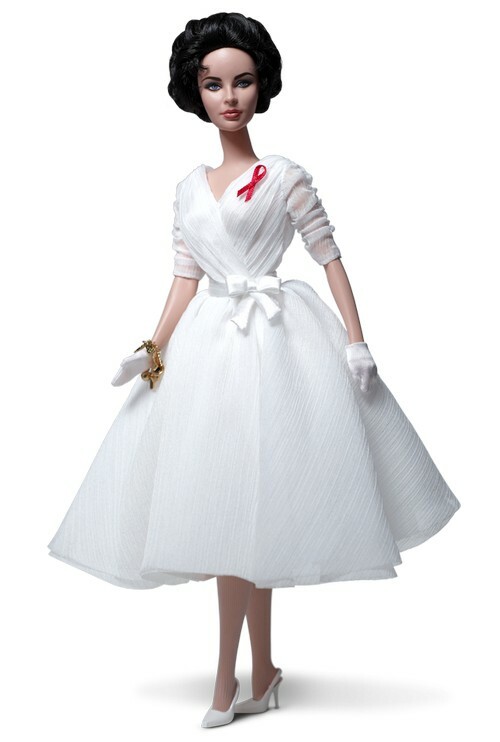 On the dress is a red ribbon which signifies a cause that was close to Elizabeth’s heart, finding a cure for Aids. The doll comes with accessories: a movie script; crown; sunglasses and of course jewellery. The doll is not the first to be modeled on the late actress, as one has already been produced capturing the look from her hit film ‘Cleopatra‘ and another in a semi-sheer sleeveless chiffon violet gown, with a real Swarovski crystal necklace. I’m sure if Elizabeth was still with us she would be happier to see the Barbie doll than to see Lindsay Lohan playing her in a movie. Elizabeth passed away at age 79 on March 23, 2011, surrounded by her four children.